Researchers have developed a method for growing liver cancer cells in the lab. Liver cancer (hepatocellular carcinoma or HCC) is the fourth leading cause of cancer death worldwide. A major challenge in developing effective drugs for liver cancer is the inability of current pre-clinical tumor models to accurately replicate features of the cancer and the environment in the human body in which the tumor is located. This has led to many potential drugs to fail in clinical testing. Seeking to more accurately mimic the tumor environment to grow liver cancer cells, researchers developed models of these kinds of cancerous growths, called patient-derived xenografts (PDX). Although these models provide a more accurate picture of how effective potential cancer drugs would be in humans, they’re also expensive and time-consuming for drug screening. Growing these PDX cancer cells in the laboratory (in vitro) would be a more cost effective and faster way to test for drug efficacy. However, attempts to culture these cells robustly have been largely unsuccessful, until now. The research team managed to grow cancer cells derived from 14 liver cancer PDX on a synthetic 3D scaffold made of a plant-based porous hydrogel. The researchers engineered the spongy scaffold with optimized biochemical and mechanical properties, to help liver cancer cells maintain their proper shape and function and grow as organoids. By effectively recreating the tumor environment in the liver, researchers can now grow cancer cells from PDX in a petri dish for drug testing. 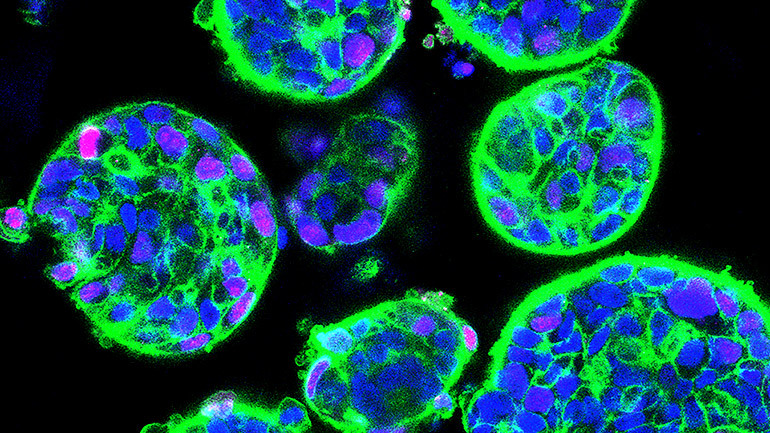 After growing the cells as organoids for one to three weeks, the team verified that the liver cancer cells in the organoids were alive and reproducing. Additionally, liver cancer cells usually contain specific genetic changes that are absent in healthy liver cells. Most of the organoids retained the same key genetic changes that were in the source PDX cells. They also maintained an important feature of liver tumors—intra-tumoral heterogeneity. Not all cancer cells within a tumor are the same; distinct populations of liver cancer cells exist within the same tumor and may affect its response to treatment. The presence of this feature is another advantage that the organoids have over traditional cell culture methods as a pre-clinical model for drug screening. In the latter’s case, all cells are identical. Another attractive feature of the 3D organoids in scaffold is their small size—a mere 100 microns. These organoids in scaffold can easily fit inside the well of a 96-well microtiter plate (a flat plate with numerous “wells” that function as small test tubes). The microplate has become a standard tool in analytical research and clinical diagnostic testing laboratories. This is a standard platform used for high-throughput drug screening, and enables researchers to test many drugs at the same time. Through this technology, researchers can use one PDX to produce tens to hundreds of such scaffolds containing organoids. Combined with their ability to recapitulate the genetic features and heterogeneity of the original liver tumors, these tumor avatars have the potential to revolutionize the screening and development of liver cancer drugs for patients. “The spongy scaffolds were developed to keep normal liver cells happy and also preserve the important properties of liver cancer for drug testing. This could one day allow patients to choose the best treatment based on the drug testing results of their own liver cancer cells,” says Hanry Yu, group leader at the Institute of Bioengineering and Nanotechnology, A*STAR, and the physiology department at the National University of Singapore. “As a bioengineer, this study truly epitomizes the positive synergy we can achieve in growing patient tumors outside the body by marrying advances in tissue engineering with cancer biology,” research co-leader Eliza Fong adds. And the availability of a reliable platform to grow liver cancer patient-derived cells is a major step in personalized medicine, says Toh Tan Boon, who led the research alongside Fong. “We can now use them for increased throughput drug sensitivity testing,” he says. The researchers report their findings in the journal Biomaterials. Researchers from National University of Singapore’s physiology and biomedical engineering departments, the Cancer Science Institute of Singapore, the Institute of Bioengineering and Nanotechnology, A*STAR, and the National Cancer Centre Singapore contributed to the work.